My view of how science should be taught was shaped partly by a walk in the woods I took one time with my husband Jim shortly after we were married. As we walked along, Jim would point casually to a tree or some other plant and readily name it and tell me something about it. It struck me that I had graduated with a bachelor’s degree in chemistry and a master’s degree in biology, but I did not know the names of the simplest plants, while Jim, who had little formal science training, knew nature in a way I marvel at even to this day. What did he have that I didn’t? My knowledge was abstract and formal, while Jim’s was concrete and particular. I had grown up close to the city, while Jim had grown up on a farm. I had learned about animals and plants, but Jim knew them first-hand. I want to be careful when I say this because I don’t want to commit the Romantic Fallacy now so prevalent in education—the idea that an orderly presentation of material in a classroom setting is automatically inferior to the currently fashionable hands-on, discovery learning. I believe that many of the things my husband knows can be learned from teachers and from books; the problem is that we just don’t do it. There is a lot that could be said for the idea of having our kids grow up on a farm like my husband did, but most of us obviously can’t do that. We have to find a way to learn the same things he did in a more formal environment. And it can be done. My husband’s science education was thoroughly classical, even though he didn’t know it. What my husband learned that many modern students never do is the names of things, their basic properties, and how they relate to one another. My husband probably never learned much about philosophers like Aristotle until he attended college, but the way he learned about nature was exactly what the ancients themselves taught: observation, definition, and classification. These seem like very basic things, but too often we neglect them as we plunge into laboratory-style science in the early grades. Students may eventually need to know something about how to work a microscope, how to measure mass, volume, and length, and how to organize and analyze data. But first they need to know insects, trees, and birds. 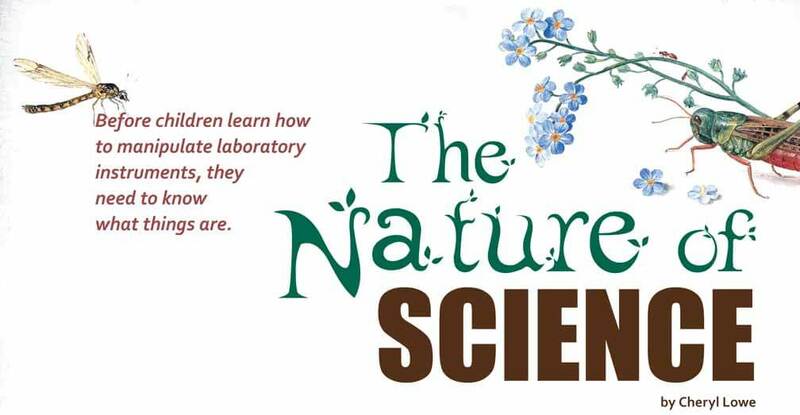 This simple truth gets lost in the craze for laboratory science in elementary grades. Before children learn how to manipulate laboratory instruments, they need to know what things are. I taught science in high school for a number of years, and I know the value of the scientific disciplines, but what I also know is what happens when students don’t learn the basics first. When I was in elementary school, there was little emphasis on science. The emphasis was still on reading, writing, and arithmetic. There was no serious science until high school and, truthfully, even there the science was not outstanding. The math, however, was great, which accounts for the fact that I did well in college, majoring in chemistry and biology, obtaining a masters and over 100 hours of college science. Today, science is emphasized on the same level as the basics. Most schools teach science every day K-12, and the result has been students who not only don’t know science very well, but whose reading, writing, and math skills are worse than ever. The increased emphasis on science began in the 1960s, spurred on by the fear that the Russians were outpacing us in science after the launch of the Sputnik satellite in 1957. I had the first group of students who had come through the new science education when I taught chemistry in a public high school in the 70s. They had poor math skills due to the “new” math, and poor reading and writing skills. It wasn’t all due to the time spent on science, but coupled with poor instruction in the basics, it was disastrous. I can say without qualification that I would rather have a student for high school chemistry who has never had a day of science but has good math, reading, and study skills, than one that has had ten years of science every day but is deficient in the basic skills, particularly math. It would be nice to have both, but realistically there just isn’t time to accomplish both, at least in a school setting. You have to make choices. C. S. Lewis once said that second things suffer when put first. This is exactly what I saw in my chemistry classroom, where much of the time, rather than teaching chemistry, I had to teach the math they should have known but didn’t because they had spent too much time being taught science in elementary school and too little time being taught math. If they had learned math, they could have done chemistry, but because they were required to do science and math, they didn’t know their math, and therefore couldn’t do chemistry. 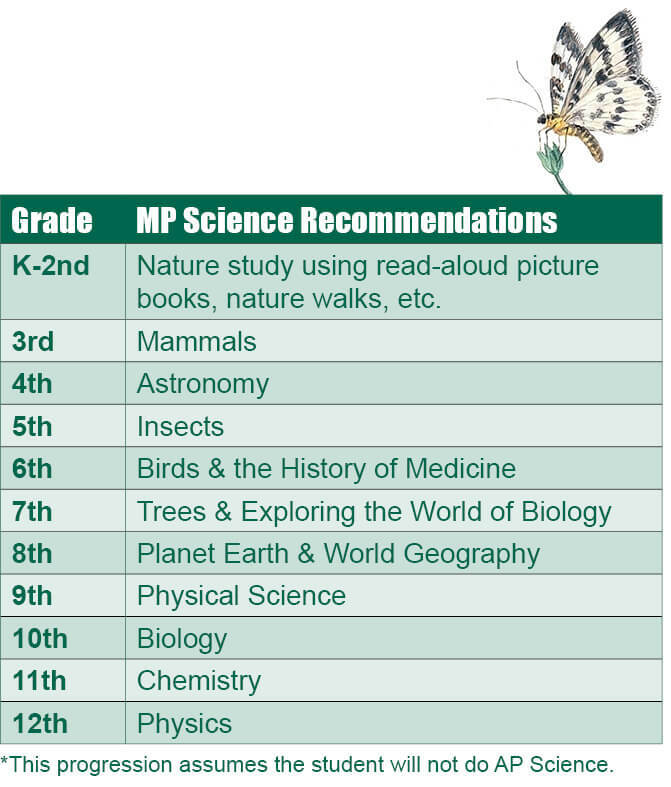 The Memoria Press science curriculum teaches the classification system for bugs and birds. This is what the ancients did first. This Aristotelian approach to science is both classical and age-appropriate for the younger student. Students should learn to appreciate nature before they learn how man has exploited it for his own benefit. Much of the discussion about science in the homeschool community centers on creation. But while we talk a lot about creation, it is only an abstraction unless students know created things first-hand. In pursuing science in this way, it is easy to make it cross-disciplinary. English poetry, for example, is full of nature references. England is the most rural of the European nations and the English more than most other people were in touch with things around them. They knew nature first-hand, and much of their poetry is filled with references to it. Memoria Press’ science materials are meant to be covered in approximately one hour each week. They cover constellations, bugs, birds, and trees along with the wonderful John Tiner books on the history of science. We encourage our students to read widely in science and not depend on the school to teach what can easily be learned at home in the years before high school. Save your time for high school biology, chemistry, and physics, where formal instruction really is needed. The basics are so important that they should not be sacrificed to secondary subjects, particularly science. To a lot of homeschoolers in particular, this will sound like Charlotte Mason, but it is really just common sense.